Voters pack into the South Berwick annual budget meeting Tuesday night. 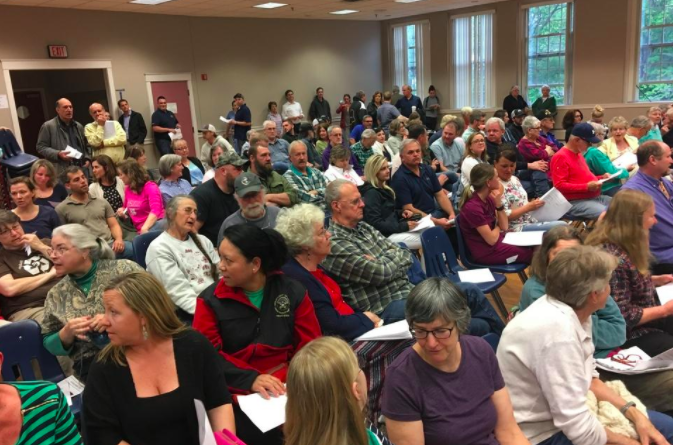 SOUTH BERWICK, Maine — A majority of voters approved funding for a new police station at the town’s annual budget meeting Tuesday night. The vote was 162 to 27 in favor of allowing the town to appropriate $4 million in bonds to construct the police station, which will be situated adjacent to the Farmgate condominium community on Route 236. Cost to South Berwick taxpayers for the project will total $28 per $100,000, or about $75 on the average home, for the first year. Construction will likely begin this fall. Before the vote, several town residents questioned why the Farmgate site was chosen for the police station and not a Norton Street location, as was originally proposed for the station. In response, Town Council Chairperson Jack Kareckas stated that the police station has been a prominent topic during more than 70 town council meetings. He further noted that the council chose the Farmgate site for the police station in November 2017. “The requirements for the police station were based on (U.S.) Department of Justice standards and the Norton Street site just didn’t work,” said Kareckas. The council chairperson also cited such concerns as Department of Housing and Urban Development leases near the former Cummings Mill and significant community opposition as causing the council to turn away from the Norton Street site. One resident, John Rudolph, favored a town-wide vote in November for the police station funding. However, according to Town Manager Perry Ellsworth, such a delay in funding might jeopardize the 3.5 percent interest rate on municipal bonds that the town is seeking for the project. Regarding the interest rate, resident Richard Clough urged the councilors to commit to the targeted interest rate or not move forward on the station’s construction. “It would be fair for the council to tell folks what the cut-off point is,” he stated. Immediately following the meeting’s conclusion, Police Chief Dana Lajoie expressed gratitude for voters’ approval. Later, the council conducted a special meeting to set a June 12 public hearing to consider the friendly taking of land, amounting to 2.5 acres, from the Farmgate community for the police station site. The meeting will take place at 6:30 p.m. in the council’s second-floor chambers in Town Hall. Following the hearing, the council will move forward with legally taking possession of the land.